Irish coffee. Photo courtesy Home Essentials. There are two more days to plan for St. Patrick’s Day. Even if you aren’t Irish, it’s a reason to celebrate with friends and family. If you do nothing else, treat yourself to an Irish Coffee, which was invented in Ireland—for trans-Atlantic airline passengers on layovers (the history). Irish Coffee is easy to make. Invite friends over to toast with a cup or two. 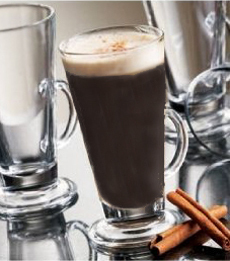 Try these Irish Coffee recipes. Consider serving it with a slice of Irish Coffee Cheesecake. For some reason, National Irish Coffee Day is January 25th (in the U.S., not in Ireland). Note to the people who apply for and declare these holidays: Why? Find more coffee recipes in our Gourmet Coffee Section.